We'll be honest, we have never been fans of the traditional sleeping bag. They're made of cheap fabrics, they're generally only suitable for a particular season and they're very difficult and expensive to launder. So we decided to design our very own version of a sleeping bag which we are imensely proud of. The Snuglux® Duvet Sleeping Bag is stylish and luxurious, combining the warmth and comfort of a sleeping bag with the practicality of a duvet cover. The Snuglux Sleeping Bag has a removable cover, just like your home duvet, which means that you can launder the cover without the filling. This is a huge advantage as every-time you wash a conventional sleeping bag you damage the fibres of the filling. Our Sleeping bags are made from the same fabrics as traditional bed linen, including percale poly/cottons and 200 or 400 thread count Egyptian cottons. They also look beautiful and can be made to match your interior. 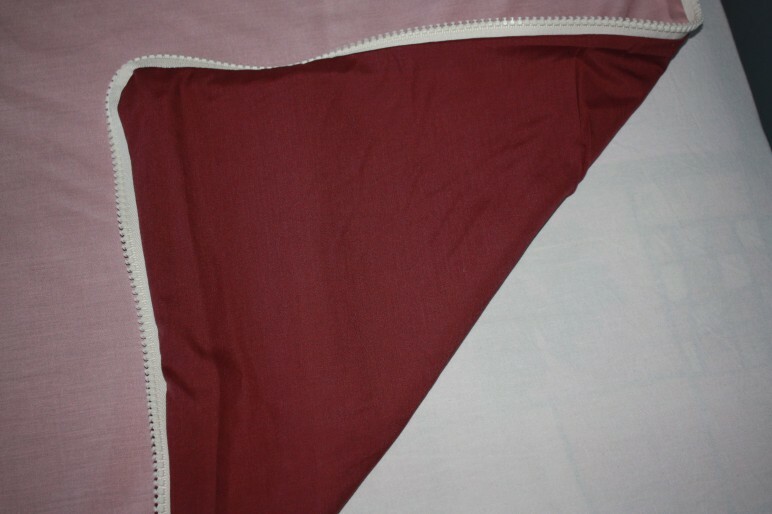 The Duvet Sleeping Bag Cover has a zipped opening to allow the duvet to be inserted. Unzip the opening fully. 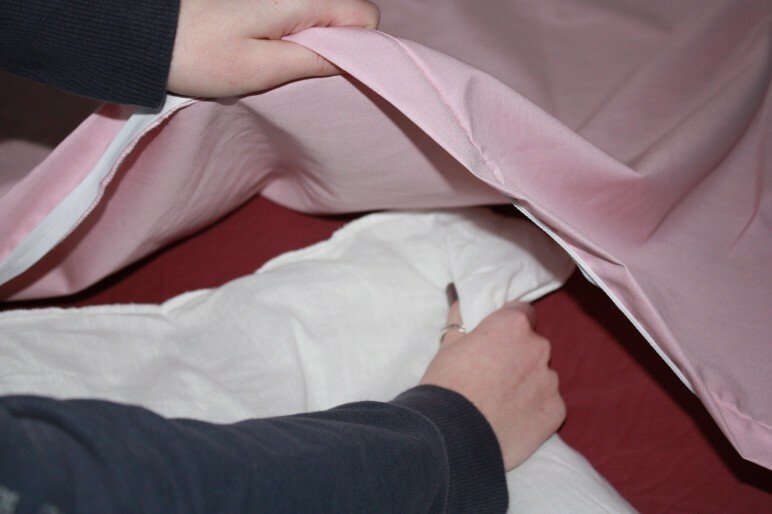 Insert your desired tog rated duvet into the cover, just as you would with your duvet at home. 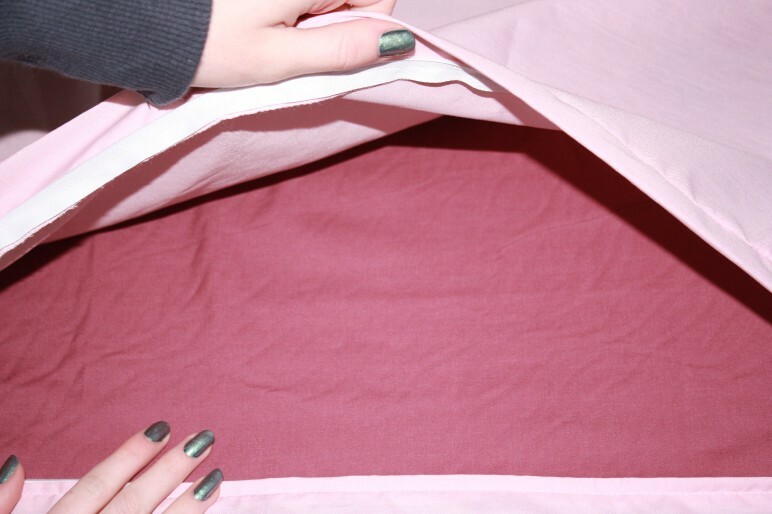 Once the duvet is inserted, zip up the opening and fold the whole cover with the duvet in half. The Duvet Sleeping Bag cover has a large plastic zip around 3 sides. The start of the zip is in the middle, at the foot of the cover. 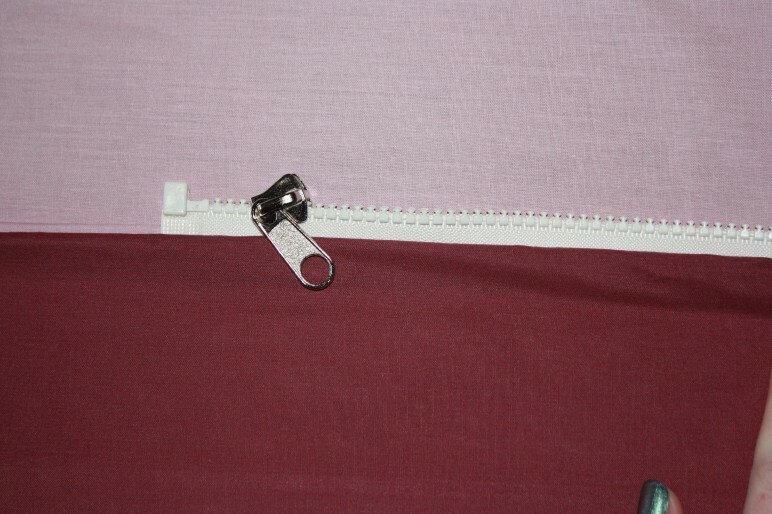 Once the cover is folded, the two ends of the zip come together and the zips can be joined. Begin to do the zip up along the bottom edge of the cover. 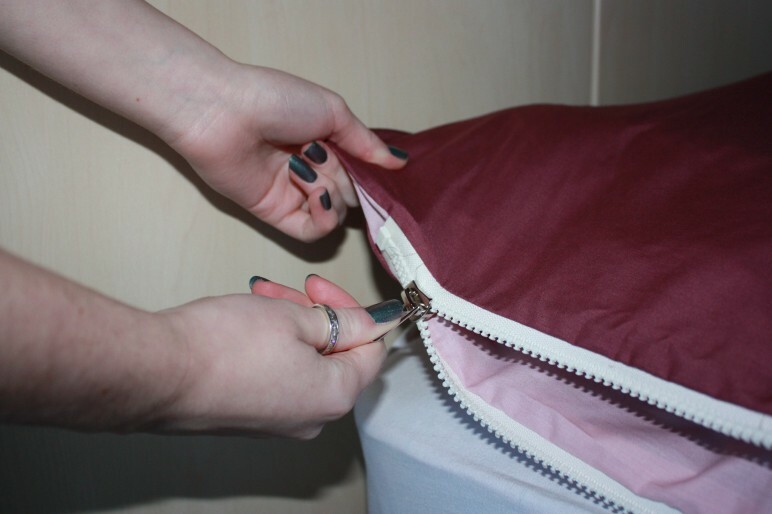 Continue to zip up along the length of the cover Once fully zipped up, your Duvet Sleeping bag is now ready to snuggle down in. Click HERE to go back to the Duvet Sleeping Bag page. You can choose to be as warm as you want by selecting your preferred tog rating from our range of Fogarty Hollowfibre duvets, all of which are anti-allergenic and machine washable. Alternatively, you may choose to use your existing home duvet as the filling. Our Adult's sleeping bag takes a standard double duvet (2m x 2m). You fold it in half and zip it along the bottom and the side, forming a sleeping bag which is a generous 1m wide x 2m long. 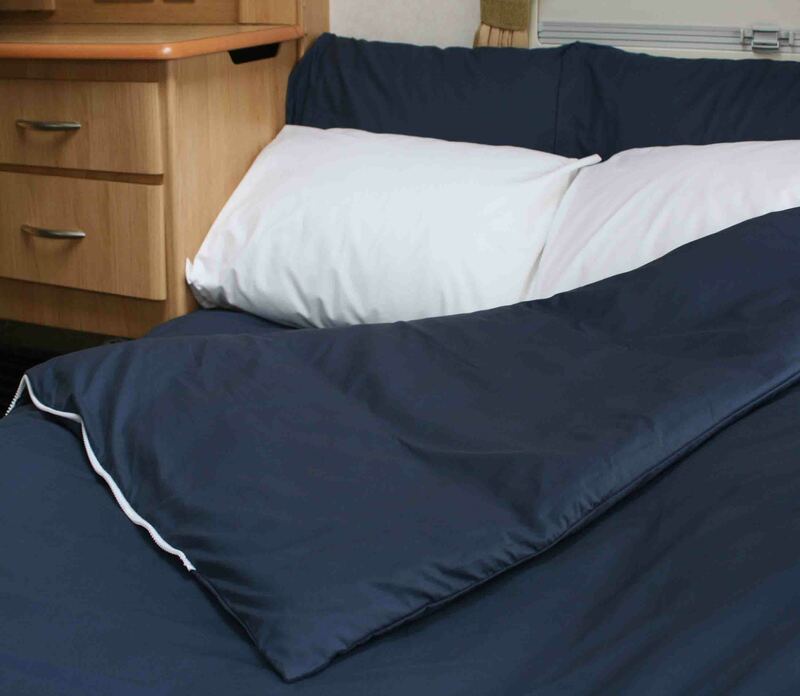 If your bed doubles as seating during the day, whether it be in a caravan, motorhome, boat or truck, you can easily turn it into a cosy bed by throwing on our Duvet Sleeping Bag. And in the morning, you just roll it up and stow it away! If you want to create a 2m x 2m double sleeping bag, simply purchase 2 Adult's sleeping bags and zip them together. We also make bespoke double sleeping bags to any size or shape. We call these Duo Duvet Sleeping Bags. The Shaped Double Bed Duo Duvet Sleeping Bag is, quite simply, 2 duvets in covers that zip together to form a sleeping bag for your particular shape and size of bed. It may be any size or shape: square, rectangular, with a cut off corner, V-berth for boat bow berths, rounded end for island beds... it is made to your requirements. 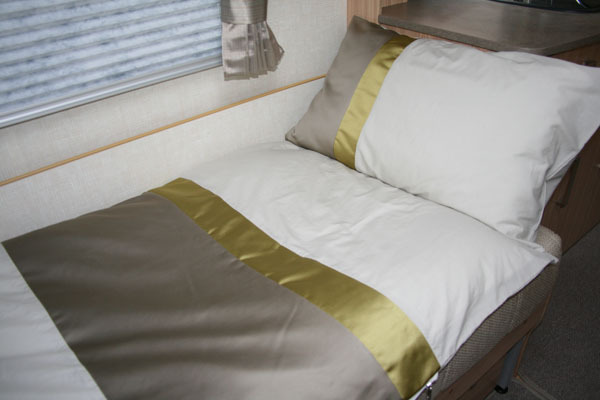 (We have the measurements for most caravan and motorhome beds.) 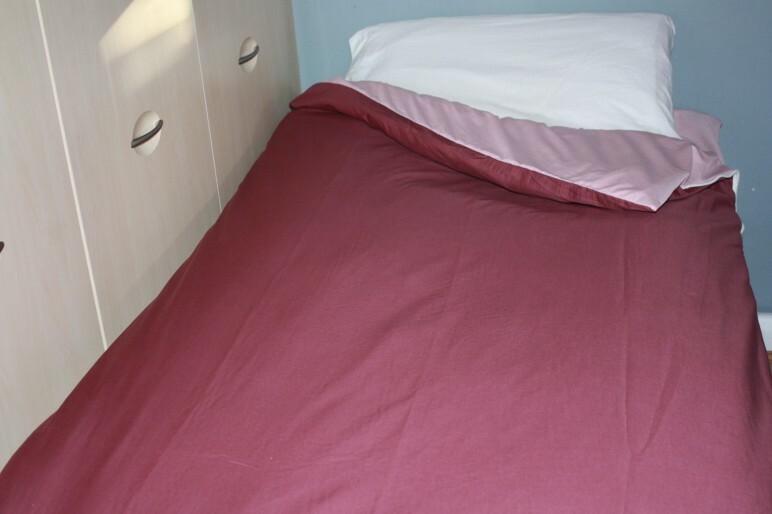 We normally make a Shaped Double Bed Duo Duvet Sleeping Bag a minimum of 69" wide (1.75m) so that there is not too much overhang but there is room for 2 people. 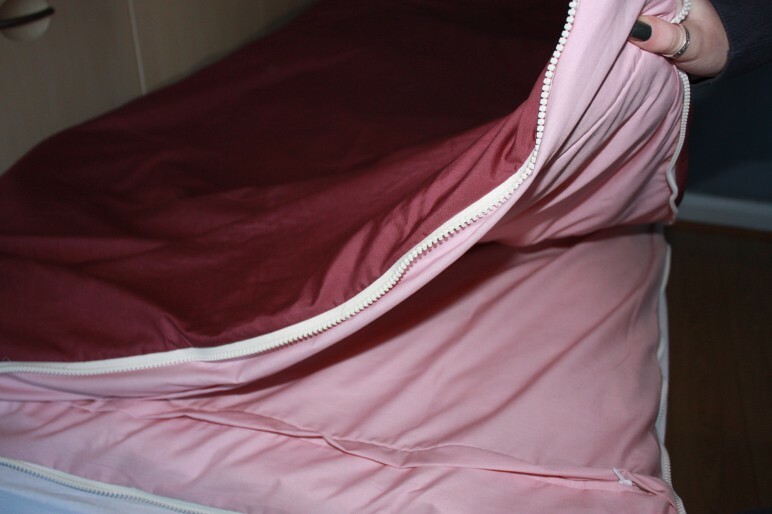 If you have caravan with a "made up" bed in the dinette area, we recommend purchasing a bespoke rectangular Shaped Double Bed Duo Duvet Sleeping Bag rather than a standard double sleeping bag (formed fron 2 adult's sleeping bags) so that it is not too big. Comfortable. 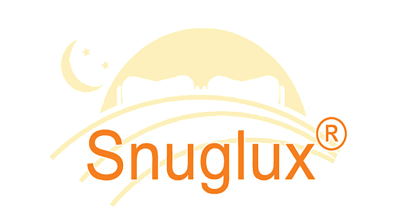 With all the warmth and cosiness of a sleeping bag, there is never a cold shoulder when using a Snuglux Duo. A solution for all seasons. You can mix and match the fillings of each duvet, e.g. a 4.5 tog on the top and a 9 tog on the bottom for summer and vice versa for the winter. Space saving. For regular sized beds. there is no need to store bulky sleeping bags or separate bedding for your travels. Practical and economical. For laundering, simply remove the duvets and put the covers into the washing machine, saving money on costly launderette charges. Easy access. 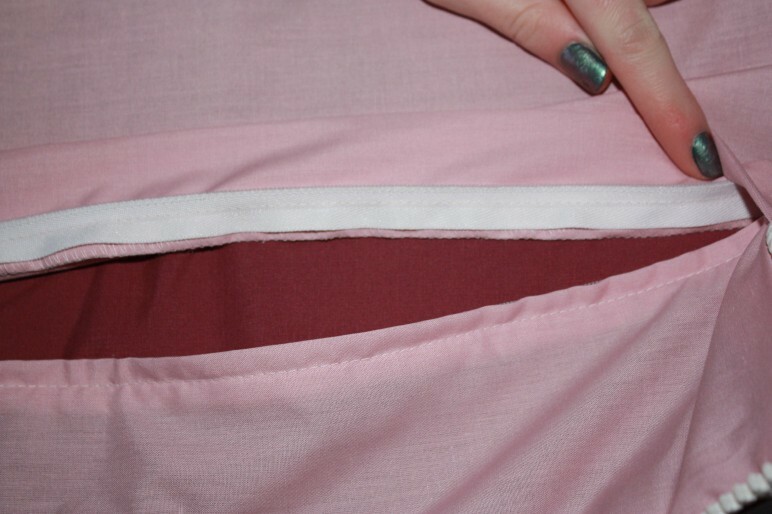 With a zip on each side, you can get in and out of bed easily, without disturbing your partner. Flexible. For symmetric shapes, each double cover and duvet can be folded in half and zipped with itself to create a single sleeping bag, giving you either two singles or one double from a set; ideal for touring when you don't want to keep making up the double bed.